Cover Story: A Jalbert parafoil that pulls a truck sideways (photo by Ted Manekin)-and other inspiration from the AKA’s first national meeting at Ocean City, MD, including Wyatt Brummitt’s “…the sky is big enough for all of us…” speech. Features: A kitechnology report by Curtis Marshall on cutting nylon. Departments: What’s New: Kites: the Skyworks Flying Line, Stormy Weathers’ Winged Victory, the Cloud Pleasers delta-Conyne, and Rainbow stunt kites; What’s New: Books: Come Fight a Kite, by Dinesh Bahadur; Design Workshop: the Flow Form by Ed Grauel and Margaret Greger; News From Here & There: Paul Walker on the Family Day Kite Festival in San Francisco, CA; John DeGange on the Connecticut Kitefliers Association; Karen Schlesinger on the 4th annual New York City Kite Festival; Scott Banks on the 2nd annual Yachats Kite Festival, OR; the Canadian National Exhibition Kite Festival; the 2nd Cornwall Kite Festival, England. Jalbert’s biggest, a 20 x 20-foot Parafoil, powered by 25-knot winds in Ocean City, MD . 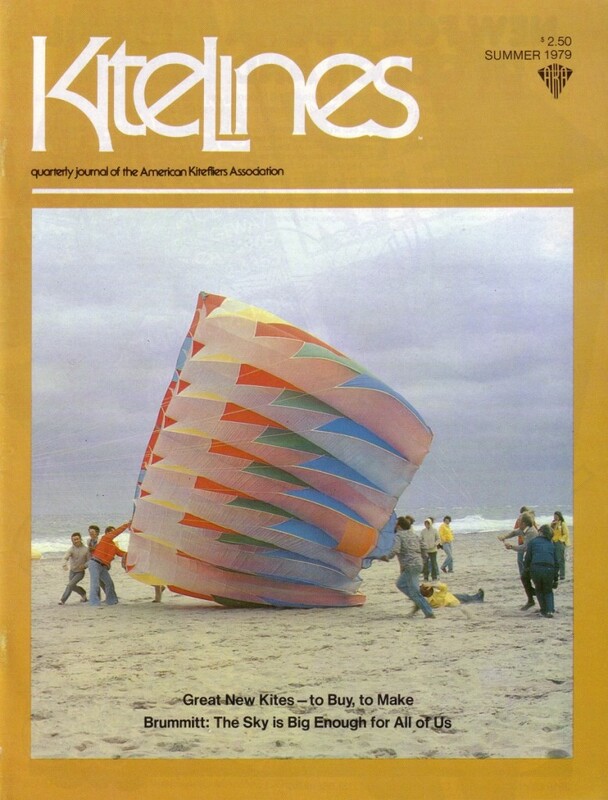 It tosses men about like toys, but a careful crew led by G . William Tyrrell, Jr ., of Willow Grove, PA, manages to control the kite with everything short of whips and chairs . Tied to a 6000-lb . truck, parked sideways, it drags the truck. Tracks are carved in the sand . The kite wins the $200 prize for Strongest Pulling Kite-and wins the hearts of spectators and participants as well . The Parafoil was only one of the breathtaking spectacles at Ocean City, as seen in further detail on pages 22-23. Photograph by Theodore L . Manekin.